Contrary to popular belief, people with oily skin are not the only ones who have to worry about acne. People with dry skin also experience blemishes and breakouts along with flaking, dryness and irritation. Whether you have skin that’s oily, dry or somewhere in between, hydrating acne-prone skin is essential. Here are Dr. Joel Schlessinger’s tips for finding the right moisturizer. What sort of formulas should I use? Dr. Joel Schlessinger recommends his favorites. If you consistently experience blemishes in the same areas, clogged pores may be to blame. When excess oil, dirt and bacteria remain in the pores, the skin cannot heal itself and acne returns again and again. Along with regular exfoliation, you should use a moisturizer that is non-comedogenic. Non-comedogenic products are proven to contain ingredients that will not clog pores. You should also steer clear of pore-clogging ingredients such as mineral oils and petrolatum, which are found in many moisturizing products. SkinMedica Ultra Sheer Moisturizer provides lightweight hydration without a heavy formula. Another way to deal with clogged pores is to use a moisturizer with an exfoliating ingredient in it such as salicylic or glycolic acid. Jan Marini Bioglycolic Bioclear Face Cream unclogs pores with glycolic acid and prevents dryness, flaking and irritation that can be caused by acne treatment products. Can I skip moisturizers on some days? Dr. Joel Schlessinger recommends against it. One of the biggest mistakes you can make when dealing with acne is to skip moisturizing, especially if you have oily skin. Skipping your moisturizer encourages your skin to produce more oil, which leads to clogged pores. Keeping the complexion hydrated will help regulate oil and reduce shine. If your skin is oily and you’re worried about shine, try LovelySkin LUXE Mattifying Antioxidant Moisturizer. The oil-free formula does not clog pores and it leaves a matte finish to the complexion. If you have dry skin or are on aggressive acne treatments that dry out the complexion, try Avene Clean-Ac Hydrating Cream. Do you have a question about whether your moisturizer is right for acne-prone skin? Ask Dr. Joel Schlessinger in the comments! Hair loss is a common condition that affects about 80 million people in the United States. Though it is natural to lose a few hairs, a growing bald spot or widening part may be a sign of hereditary hair loss. In this post, Joel Schlessinger MD explains the causes and treatments for thinning hair. Dr. Joel Schlessinger explains hair loss. Hair loss is most often hereditary but may also be the result of a diet lacking essential vitamins, nutrients, minerals or protein. Sudden changes in weight or crash dieting may also cause hair to thin. Hair loss associated with poor diet is usually temporary, but it may take time for hair to return to its natural thickness. After giving birth, women may experience significant changes in hair volume. A surge of estrogen during pregnancy causes hair to become fuller and lusher. After childbirth, estrogen levels begin to regulate and hair tends to fall out as it resumes its normal growth cycle. Losing hair may also be a sign of infections to the scalp including ringworm, folliculitis, eczema or staff. These infections are typically associated with symptoms such as itching, flaking skin or irritation. If you experience these symptoms in addition to excessive hair loss, it is best to see your dermatologist. Dr. Joel Schlessinger recommends hair loss treatments. PHYTO Phytolium 4 Thinning Hair Treatment is effective option for treating thinning hair. After 16 weeks of clinical studies, 79% of users experienced a reduction in hair loss and 39% of users saw an increase in growth. This natural, paraben-free treatment is specially formulated with capucellpro to prolong the life of existing hair. A blend of essential oils and extracts helps to delay thinning and promote healthier hair blubs, as well. The HairMax LaserComb is the only home-use laser photo therapy device approved by the FDA. Its laser light energy stimulates hair follicles to reverse the thinning process. It also increases hair density and revitalizes damaged hair. When used for 15 minutes three times a week, most users start seeing improvement in as little as 16 weeks. Klorane Shampoo with Quinine and B Vitamins strengthens and nourishes hair for healthier growth. This hypoallergenic, silicone-free shampoo contains the natural invigorating ingredient quinine to improve follicle growth. Vitamin B cleanses, detangles and volumizes hair while activating the scalp’s microcirculation to encourage stronger hair. Nourish hair and promote existing growth with Viviscal Professional Supplements. These dietary supplements are formulated with a blend of marine ingredients, apple extract, biotin, vitamin C and essential amino acids to nourish existing hair and increase density. Taken orally twice a day, they nourish hair from within. If you experience scalp irritation along with hair loss, see a board-certified dermatologist like Dr. Schlessinger. 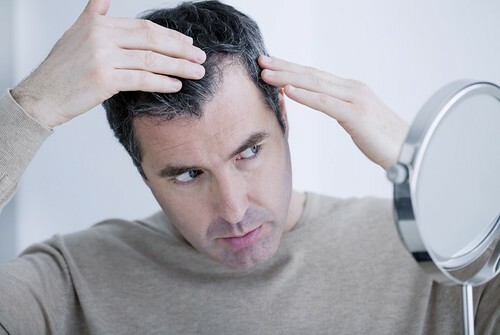 Hair loss accompanied by itching or flaking may be a sign of infection. Consult your dermatologist who can provide you with the best course of treatment. Do you have questions about hair loss? Ask Dr. Schlessinger in the comments section. Visiting the dermatologist is an important step to maintaining your health. Your skin is the largest organ of your body and it’s essential that you take good care of it. Sometimes it can be difficult to determine what requires professional attention, so Dr. Joel Schlessinger is here to explain five of the main reasons you should see a dermatologist. Dermatologists can handle a variety of skin, hair and nail concerns, Dr. Joel Schlessinger shares. If you’ve ever sat in the doctor’s office wondering if your condition falls under the realm of dermatology, you’re not alone. The bottom line: if it affects your skin, hair or nails, chances are you’re in the right place. Read on for five main reasons you should make an appointment to see a dermatologist. If you struggle with acne, the sooner you can see a professional, the better. 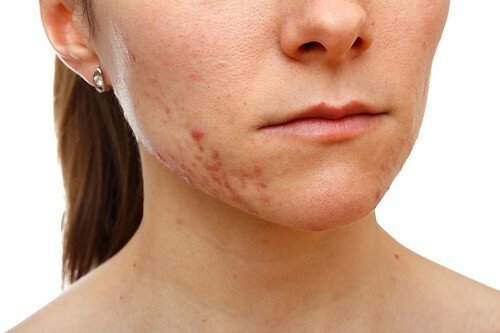 Acne can easily cause severe scarring and, once scarring has occurred, there is little that can be done to improve it. By addressing breakouts early, you can avoid unsightly scars altogether. Your dermatologist can create a custom treatment plan to address your specific needs and even suggest an effective skin care routine that will help keep your acne under control. 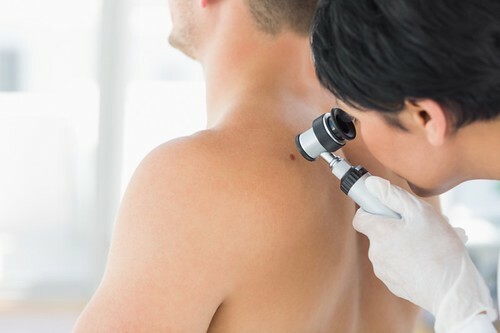 A change in a mole or growth is generally the first sign of skin cancer. Self-examination and yearly checkups are essential to catching skin cancer in its early stages. If diagnosed and treated early, skin cancer is easily cured. Even if you’re diligent about looking for changes in your skin, it’s still important to schedule an annual exam with your dermatologist. These experts are uniquely qualified to recognize, evaluate and treat skin cancers, ensuring the earliest possible detection. Whether it’s a sudden rash or itchy, irritated skin, sudden changes in your skin can sometimes be a sign of something bigger. If you notice your skin changing, it’s best to see a dermatologist for a proper diagnosis. It could be an easily treatable skin condition like eczema, psoriasis or rosacea, but it could also be a symptom of a bigger health concern. The same goes for your hair and nails. Gradual or sudden hair loss could be caused by a variety of things. Similarly, nail discoloration, peeling and splitting could be the result of a number of factors. Visiting your dermatologist will ensure you receive the right treatment for all your concerns. Aside from treating a variety of skin conditions, dermatologists can also address cosmetic concerns. If you’re considering a cosmetic procedure like Botox or laser hair removal, your dermatologist should be your point of contact. Day spas might offer these treatments at a discounted rate, but they often don’t have a qualified or experienced professional on staff to perform the procedure. When it comes to your appearance, you want to choose a board-certified dermatologist with the knowledge and experience to help you achieve your best results. Lastly, the biggest benefit of regularly visiting your dermatologist is tapping into their wealth of knowledge. Your dermatologist can help you better understand your skin concerns, learn how to protect your skin from the sun and answer any lingering questions you might have. They’ll also be able to recommend the best products for your skin type and concerns. Armed with all of this information, you’ll be well on your way to healthy, beautiful skin. Visit Dr. Joel Schlessinger for all your skin, hair and nail concerns. As a board-certified dermatologist and cosmetic surgeon, Dr. Joel Schlessinger sees patients every day at his practice in Omaha, Neb. He and his staff have the skill, expertise and knowledge to find the right treatment plan for you. From simple to complicated skin conditions, Dr. Joel Schlessinger has the medical background to properly diagnose and treat your concerns. Do you have a question for Dr. Joel Schlessinger? Share with us in the comments. Many teens and young adults struggle with severe acne. This type of acne is characterized by deep, painful cysts and nodules that can be difficult to treat. Additionally, as this type of acne begins to clear, the skin easily scars. For decades, dermatologists have been prescribing Accutane, which is an extremely potent form of Vitamin A, to fight severe acne that hasn’t responded to other treatments. It has also greatly helped patients who struggle with severe scarring acne. But while Accutane is a strong drug with many known side effects and restrictions, there’s also a lot of myth surrounding this prescription, especially how it affects a patient’s skin and body. In this blog post, Dr. Joel Schlessinger explains how Accutane works and what you can expect while on this medication. Accutane is successful because it targets all four causes of acne, Dr. Joel Schlessinger explains. Accutane is the only acne treatment that fights all four causes of acne: excess oil production, clogged pores, P. acnes bacteria and inflammation. More specifically, Accutane reduces the amount of oil your skin produces, eliminates acne-causing bacteria and reduces skin inflammation. By stopping the source of ‘food’ for the bacteria by drying up the oil, the bacteria die and this usually contributes greatly to improvement. This treatment also slows down how fast skin cells turn over inside the pore, preventing them from becoming clogged in the first place. Because this treatment targets acne from every angle, it is very effective at eliminating breakouts. Nearly 85 percent of patients see significantly clearer skin after one course of treatment, which usually lasts between four to five months. Better yet, 73 percent of Accutane patients never have to repeat a course and are clear thereafter. As with any medication, Accutane does have side effects, says Dr. Joel Schlessinger. Some common side effects of Accutane include dry skin and chapped lips. Dermatologists recommend keeping your skin well hydrated while on this medication. Dr. Joel Schlessinger recommends FixMySkin Healing Balms with 1% Hydrocortisone to his Accutane patients. Available for the lips and body, this medicated balm has chemical properties that go beyond moisturizing to relieve itching and heal skin. The hydrocortisone treats inflammation and irritation while moisturizing shea butter and cocoa butter provide relief from dryness and itchiness. There are widespread concerns that this medication has been linked to inflammatory bowel disease and possibly even suicide and depression. Studies have since proven that IBD is not associated with Accutane. Additionally, studies on the correlation between Accutane and depression have not been conclusive. Many dermatologists have found that once a patient’s acne clears up, their depression subsides. As with any medication, dermatologists monitor their patients closely for signs of any side effects. Further, long-term studies are currently being performed. The most concerning side effect can occur if a woman becomes pregnant while on Accutane. This medication can cause severe birth defects, premature birth and even miscarriage. It is important that women do not take Accutane while pregnant and do not become pregnant while taking this medication. For this reason, all patients who can become pregnant must take pregnancy tests before and while taking Accutane. Do you have questions about Accutane for Dr. Joel Schlessinger? Share with us in the comments. Eczema, or atopic dermatitis, is a chronic skin condition characterized by a red, itchy rash. 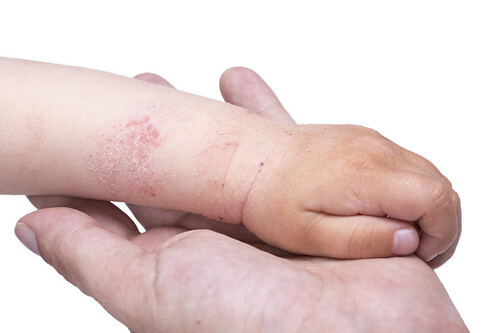 Though it’s most common in children, adults often struggle with eczema as well. An estimated 30 million Americans are said to have it, with many going undiagnosed. If you’ve noticed symptoms of eczema in you or your child, you’ll need to make an appointment with your dermatologist right away. They are your best resource for information, and the earlier the case is assessed, the easier it will be to manage in the long run. Dr. Joel Schlessinger recommends keeping a log of eczema symptoms. Before your first appointment, there are certain steps you can take to help your dermatologist give you the best possible care. In the days or weeks leading up to your session, keep a detailed log of signs and symptoms, jotting down as much as you can about the condition of your or your child’s skin. You’ll want to list symptoms, any changes that occur in symptoms over time and a list of potential triggers. If you noticed that the rash appeared to worsen after a long, hot shower, for example, you’ll want to make a note. Be on the lookout for other common irritants such as soaps and detergents, sweat, pet dander and sun exposure. Certain foods are suspected to cause or trigger eczema, especially in infants and toddlers, but studies are inconclusive. If you suspect a link between eczema and diet, you may want to log your or your child’s meals and snacks, and also any vitamins, supplements or medications. It’s a good idea to bring these items to the appointment so that your dermatologist can look over dosages and directions. This is especially important when it comes to prescription medications for preexisting conditions. Soaps and detergents that contain fragrance and dyes are often linked to eczema. These can often leave behind an irritating residue that triggers or worsens eczema symptoms. You’ll need to write down the soaps, detergents and other household products you or your child come into contact with to begin the process of elimination. Keep in mind that sometimes responses are delayed. It could be up to 48 hours after contact with the substance before symptoms are noticed, so it helps to monitor signs as they occur within a specific timeframe. Ask the right questions to better understand eczema, says Dr. Joel Schlessinger. Prepare a list of questions to ask your dermatologist that will help you better understand your unique case. Treatment for eczema is never one size fits all, and you’ll want to be sure you’re taking the proper steps and precautions to prevent flare-ups. Start with the following questions and add as many of your own as you’d like. How severe is my/my child’s eczema? Understanding the severity of your or your child’s eczema can help you form goals for the treatment and management of the condition. It can also help shape realistic expectations for controlling flare-ups. Is the condition temporary or chronic? Will it go away on its own? Some individuals develop eczema in childhood and then overcome it as they grow older. Others experience their first flare-up well into adulthood. Eczema has also been linked to asthma and allergies, so understanding the nature of your or your child’s case can provide clues about other health concerns. What is causing my/my child’s eczema? Knowing your or your child’s unique eczema triggers is crucial to controlling symptoms. Every case is different, and managing eczema may be as simple as switching detergents or it may involve bigger lifestyle changes. There are several treatments available for eczema. These range from creams or balms, like FixMySkin Healing Body Balm with 1% Hydrocortisone, for mild cases, to corticosteroid injections for more severe cases. Other options include light therapy, wet bandages and oral medications. Your dermatologist will likely have a specific treatment in mind for your individual needs, however, it’s always a good idea to understand other options to explore if needed. There is no cure, for eczema, but symptoms can be managed with diligent treatment. In addition to FixMySkin, you might explore Avene TriXera+ Selectiose Emollient Cream, a dry skin formula that can help protect skin and restore the natural moisture barrier. Dr. Schlessinger also likes EltaMD Melting Moisturizer. The lightweight treatment helps keep 90% of moisture in skin for up to 12 hours. What lifestyle changes can I make to help manage my/my child’s eczema? Managing eczema triggers can involve extensive trial and error. Your dermatologist can help pinpoint likely causes and help you get started with any changes you’ll need to make. They can also recommend the best irritant-free products available for you and your family. Dr. Schlessinger recommends Free & Clear detergents and strongly discourages the use of fabric softeners and dryer sheets with synthetic fragrance. Switching to a pure detergent as soon as eczema symptoms begin can go a long way toward managing the condition in the long run. For soaps, shampoos, sunscreens and more that are free of fragrance and dyes, try Vanicream products. The formulas are gentle enough for the whole family and perfect for daily use. Do you have a question for Dr. Schlessinger? Let us know in the comments section. Signs of aging including fine lines, wrinkles and sagging skin are often not welcome. You do everything you can to keep your skin looking youthful for as long as possible. But how do you know if the signs you’re seeing are normal for your age? In this blog post, Dr. Joel Schlessinger discusses how to tell if your skin is aging well and how you can maintain a more youthful appearance. Fine lines and wrinkles are a normal sign of aging, Dr. Joel Schlessinger explains. The first signs of aging often appear in the form of crow’s feet around eyes. These fine lines develop as a result of frequent facial expressions like squinting and smiling. Repetitive motions create creases in the skin that break down collagen and elastin fibers over time. The body also starts to produce collagen and elastin at a slower rate, preventing skin from bouncing back as quickly as it did when you were younger. Next, you’ll see wrinkles start to form on the forehead, around the lips and between the eyebrows. Much like crow’s feet, these wrinkles are caused by repeated facial expressions. You can pair skin care treatments with in-office procedures like Botox and wrinkle fillers to minimize these signs of aging. However, wrinkles are not out of the ordinary. There’s a good chance you’ll also start to see dark circles under your eyes, says Dr. Joel Schlessinger. Dark circles under eyes could be caused by a number of things including natural aging, heredity, allergies, sleep deprivation and stress. The skin around the eyes becomes thinner and more fragile with age, exposing tiny blood vessels beneath the skin. Loss of elasticity can also contribute to dark circles. As skin loses its ability to bounce back, dark circles become more prominent. Dr. Joel Schlessinger shares a few things that could contribute to signs of aging. If you smoke, you will start to see premature signs of aging much earlier than normal, including deep wrinkles, bags under eyes and dull, sallow skin. This is because cigarettes starve your skin of oxygen and constrict blood flow, which affects circulation and breaks down collagen and elastin. Smoking also depletes your body of vitamin C, a necessary nutrient for collagen production. Because smoke is a form of pollution, you’re also exposing your skin to harmful free radicals. Skipping sunscreen is another way to encourage dark spots and wrinkles. Most signs of aging can be delayed with proper sun protection. Going without any sunscreen, however, can lead to dark spots, wrinkles and other signs of photoaging. UV exposure causes collagen and elastin to break down, which leads to signs of aging. Maintain a youthful appearance with some of Dr. Joel Schlessinger’s favorite products. The best way to prevent premature signs of aging is to apply a broad spectrum sunscreen every single day. One of Dr. Joel Schlessinger’s favorite sunscreens is EltaMD UV Clear Broad Spectrum SPF 46 Sunscreen – Untinted. This oil-free formula protects skin with 9% zinc oxide. Plus, its sheer formula won’t clog pores or irritate sensitive skin. Building an anti-aging regimen will also help you maintain a youthful appearance. Dr. Joel Schlessinger suggests pairing clinically proven ingredients like peptides and growth factors for best results. After cleansing, apply NuGene NuCell Universal Serum. Formulated with growth factors, polypeptides, vitamins, minerals and amino acids, this serum helps encourage collagen and elastin production. Then, moisturize skin with LovelySkin LUXE Ultra-Rich Peptide Moisturizer. This hydrating cream contains peptides to help repair skin and argan oil to nourish and revitalize the complexion. Do you have a question about anti-aging treatments for Dr. Joel Schlessinger? Share with us in the comments. Can pores shrink? Dr. Joel Schlessinger puts an end to this skin care myth. One skin care myth that never seems to lose any steam is the idea that you can shrink your pores with a splash of cold water or an egg white mask. This is completely false. In this blog post, Dr. Joel Schlessinger explains why it’s impossible to shrink your pores and what you can do to help them appear smaller. Pore size is largely determined by genetics, Dr. Joel Schlessinger explains. Although you may not like the way they look, pores actually serve a pretty important purpose for your skin. Each pore is home to a sebaceous gland, which produces the oil that maintains your skin’s natural moisture levels. The size of a person’s pores is mainly determined by skin type and genetics. Men naturally have larger pores than women. If you have dry skin, you might not see your pores upon first glance. Oily skin types, however, have pores that are more noticeable. Additionally, those with fair skin often have pores that appear smaller while darker skin tones have pores that look larger. Different areas of the face have larger pores, as well. You can probably tell that the pores on your nose are the largest, followed by your forehead, chin and, finally, cheeks. Dr. Joel Schlessinger discusses other factors that affect pore size. Pores can appear larger if skin is not cared for properly. Over time, they become clogged with debris, excess oil and impurities that can lead to breakouts. Sun exposure can also affect pore size as UV rays weaken the collagen and elastin that act as your skin’s structural support. Additionally, popping pimples can damage skin, permanently widening pores. There are steps you can take to minimize the appearance of large pores, Dr. Joel Schlessinger says. The contents of pores can be exfoliated and cleaned out, giving them a smaller appearance. Dr. Joel Schlessinger suggests washing your face with a cleansing brush like Clarisonic Mia2 Sonic Skin Cleansing System. Although it’s gentle on your skin, this cleansing brush is powerful enough to remove impurities, cleansing your skin six times better than with hands alone. After cleansing, apply an exfoliating gel like LovelySkin Exfoliating Gel Mild 11% to gently retexturize skin. Then finish with a mattifying moisturizer like LovelySkin LUXE Mattifying Antioxidant Moisturizer, which will minimize shine and leave skin feeling soft. You can also minimize the appearance of large pores with a professional peel or extraction procedure at the spa. Do you have a question about pore size for Dr. Joel Schlessinger? Share with us in the comments. From the publishers of Practical Dermatology, DermTube offers a wealth of educational videos developed specifically for dermatologists and other industry professionals. Joel Schlessinger MD serves on the advisory board for DermTube and frequently contributes his expert knowledge through videos and other methods. In a recent video titled “Navigating the Cosmeceutical Market,” Joel Schlessinger MD talks to Nancy J. Samolitis MD about how cosmeceuticals are evolving and what effect this has on the skin care industry. Dermatologists carefully consider products before recommending them to patients, explains Joel Schlessinger MD. Ever since cosmeceuticals hit the market, many dermatologists have incorporated these products into their practices. Joel Schlessinger MD says that the only way for doctors to know which products are the best for their patients is to try each and every one. “There are a huge variety of products out there and the benefit that we have as dermatologists is that we don’t just evaluate them based on the color of the tube or whether the product smells good, but we’re going to evaluate them based on their merits,” he says. Dermatologists evaluate each product by looking at several factors including ingredients, clinical data, safety and affordability. This means that patients can feel good about using products recommended by their dermatologist. Joel Schlessinger MD discusses the possibility of the FDA regulating cosmeceuticals. Recently, there has been some talk of the FDA starting to regulate cosmeceuticals. Joel Schlessinger MD discussed how this could potentially change the cosmeceutical market. When recommending products to his patients, Joel Schlessinger MD always returns to a few favorites. Joel Schlessinger MD has tried many products over the years and he always comes back to a couple tried and true formulas. “When I look for a sunscreen, it’s almost always going to be EltaMD,” he says. Two of his favorite products from this brand are EltaMD UV Clear Broad Spectrum SPF 46 Sunscreen – Untinted and EltaMD UV Clear Broad Spectrum SPF 46 Sunscreen – Tinted. Joel Schlessinger MD and Practical Dermatology have partnered up several times over the years. Practical Dermatology has been a co-sponsor of Cosmetic Surgery Forum since its inception in 2009. Led by Joel Schlessinger MD, this multi-specialty educational symposium focuses on the latest research, treatment and techniques in dermatology and cosmetic surgery. Practical Dermatology has been a valuable partner to Cosmetic Surgery Forum over the last seven years. Recently, the publication has also made significant strides in developing creative outlets to bring relevant content to the field. To prepare for days in the summer sun, sunscreen with the proper SPF is a must to protect against harmful UVB rays that increase the risk of skin cancer. Higher SPF numbers correlate with better UVB protection, but a recent study shows that the SPF labels do not always match the SPF protection provided by sunscreens. In this blog entry, Dr. Joel Schlessinger shares an article from CBS News called, “Some sunscreens don’t live up to their SPF claims” and explains the study and ways to protect your skin from harmful UV rays. Dr. Joel Schlessinger explains the dangers of harmful UV rays. SPF, or sun protection factor, measures a sunscreen’s ability to block dangerous UVB rays that cause sunburn. UVA rays, or rays that lead to wrinkled and aging skin, are not measured by SPF but can be just as damaging to skin. Both types of UV ray increase the risk of melanoma and other skin cancers, making sunscreen an important factor for healthy skin. Skin can be damaged by UV rays after just 10 minutes of intense sun exposure. In a recent study conducted by Consumer Reports, 34 sunscreens were evaluated for their effectiveness in blocking UVB and UVA rays. To test UVB protection, different sunscreens were applied to patches of skin and exposed to six levels of UVB light. The effectiveness was evaluated by how red the skin appeared the next day. To test UVA protection, Consumer Reports applied each sunscreen to a plastic plate and shined a UV light through it to see how much light passed through each sunscreen. According to the study, 11 of the sunscreens tested were 16% to 70% less effective than advertised and did not provide the amount of SPF protection listed on their labels. Of the 34 sunscreens tested, only 15 performed well enough to earn Consumer Report’s recommendation. What I’ve been telling my patients for years, says Dr. Joel Schlessinger. Wear sunscreen with a minimum SPF 30 every day, but choose a higher SPF on days when you know you’ll be outdoors. Avoid being outside when the sun is at its peak, which is usually between 10 a.m. and 2 p.m. Protect your skin with proper clothing including wide-brimmed hats and loose-fitting long sleeve shirts. Choose a broad spectrum sunscreen such as EltaMD UV Clear SPF 46 Broad Spectrum Sunscreen to protect your skin against both UVB and UVA rays. In addition to these sun protection measures, supplements such as Heliocare Sun Protection Pills provide added UV protection. Do you have questions about sunscreen? Ask in the comments section below. Collagen is a structural protein that gives skin its strength and durability. Think of collagen as the structural wall that supports skin. Healthy collagen levels give skin a plump and smooth appearance. But as we age, collagen production slows and healthy collagen begins to break down. When collagen breaks down, skin loses its firmness and fine lines and wrinkles begin to form. Environmental factors like sun exposure and pollution have an effect on collagen, Joel Schlessinger MD says. Collagen breakdown is an unavoidable part of aging. Around 35, we start producing less collagen and skin begins to lose elasticity. But there are also environmental factors that contribute to collagen breakdown, including the sun and pollution. We’ve all heard that sun exposure contributes to signs of aging. While UVB rays burn skin, UVA rays penetrate deeper, breaking down collagen and elastin. Sun exposure also stimulates the production of melanocytes, the cells that are responsible for pigment formation. So even when the sun doesn’t burn your skin, it’s still contributing to the formation of fine lines, wrinkles and dark spots. Pollution and oxidative stress penetrate into the deep layers of the dermis, causing inflammation, dehydration and loss of firmness. When these tiny particles of smoke, soot and other pollutants come in contact with your skin, they begin creating free radicals, which are highly unstable molecules that break down collagen and impair the skin’s barrier functions. Bad habits like smoking and poor diet also contribute to collagen loss, explains Joel Schlessinger MD. A poor diet, specifically one that is high in sugar, can damage your skin from the inside out. Sugar molecules attach to collagen and elastin proteins in the skin through a process called glycation. This process produces advanced glycosylation end products, or AGEs for short. AGEs are free radicals that lead to inflammation, breaking down collagen and elastin in the skin. In addition to being harmful to your overall health, smoking has a negative impact on your appearance. This bad habit leads to premature signs of aging, deep wrinkles, bags under the eyes and dull skin. Cigarettes starve your skin of oxygen and constrict blood flow, which affects circulation and breaks down collagen and elastin. Additionally, smoking depletes your body of vitamin C, a necessary nutrient for collagen production. Because smoke is a form of pollution, you’re also coming in contact with those harmful free radicals. Joel Schlessinger MD shares how you can help prevent collagen loss. In addition to kicking bad habits, there are changes you can make to your skin care routine that will help you maintain healthy, youthful skin. Joel Schlessinger MD recommends adding growth factor products to your daily routine. These powerful ingredients work to boost collagen production and rejuvenate aging skin. Alphaeon Beauty Epidermal Growth Serum pairs growth factors with hyaluronic acid, peptides and antioxidants to help diminish the signs of aging and revitalize skin. In clinical studies, more than 80 percent of patients experienced an overall reduction in the appearance of wrinkles with this serum. Formulated with growth factors, polypeptides, vitamins, minerals and amino acids, NuGene NuCell Universal Serum encourages collagen and elastin production, helping skin repair and prevent environmental damage. With continued use, you’ll see a visible improvement in the appearance of wrinkles, fine lines, dark spots and rough skin texture. SkinMedica TNS Essential Serum contains growth factors, hyaluronic acid, antioxidants and peptides to hydrate, firm and rejuvenate mature skin. This best-selling serum minimizes the appearance of fine lines, wrinkles and uneven skin tone. With continued use, you’ll see results after just one month with best results appearing in three months. To target loss of collagen around the delicate eye area, apply Neocutis Lumiere Eye Cream (with PSP). This eye cream contains a proprietary blend of growth factors, cytokines and interleukins that help smooth wrinkles and revitalize skin. This hydrating eye cream also minimizes puffiness and dark under-eye circles for a more youthful appearance. Do you have a question about collagen for Joel Schlessinger MD? Share with us in the comments.